So I just got back to London after a long weekend in Prague. I've wanted to go Prague ever since reading Daughter of Smoke and Bone by Laini Taylor – my favourite YA fantasy – and when my Czech publisher, HOST, invited me, I couldn't believe my luck. I was there to do some interviews, a book signing, and two appearances at the fantasy and sci-fi convention CONiáš to promote the Czech versions of my books, Kostičas and Vidořád, translated by the fabulous Lenka Kapsová. The streets of Prague were a fantasia scarcely touched by the twenty-first century – or the twentieth or nineteenth, for that matter. It was a city of alchemists and dreamers, its medieval cobbles once trod by golems, mystics, invading armies. As soon as I was settled into my apartment, I went out to see if this city really was as mystical as all that. Immediately I was in a state of wonder. In my first hour of walking, I saw things I don't think I'll ever see anywhere else. A dancing marionette on a bridge of Baroque saints. A tiny gingerbread shop hidden beneath an archway. Absinthiana behind dusty windows. Antiques and well-thumbed books. Love locks clinging to wrought-iron balustrades, their keys long since given into the keeping of the Vltava. A wall claimed by the dreamers, their words a rainbow of hope and defiance. An astronomical clock that reminds you, every hour, that death is waiting, and that greed and vanity are temporal concerns. The City of a Thousand Spires won my heart in a single morning. My first public event was the signing at the Neoluxor Palace of Books in Wenceslas Square – the largest bookshop in the Czech Republic. It's always a bit of a gamble on tour as to how many people will turn up, but I was blown away by the number of readers who came to see me – the event was so full that a lot of people were standing, and I ended up signing books for about two hours. It's been quite a while since I've been on tour anywhere, as it's been so long since I last released a new book (see this post), and I could feel myself welling up as soon as I saw the crowd. I'm so grateful to everyone who came to the signing, and to my two appearances at CONiáš, where I had some fun, thoughtful, and challenging questions from both the audience and the moderator. Everyone who spoke to me was so warm, kind and welcoming, and I even got some beautiful gifts from a few people. Thank you. A few people also gave me letters at the book signing. It's so kind you to take the time to write to me – however, I'm unfortunately (a) not able to answer at the moment, due to my workload, and (b) not able to answer at all by email, as I don't have a public email address. If you feel comfortable doing so, you can send me a home address via Tumblr message (with a description of the envelope you sent it in, if possible), and I can make a note of it. I can't guarantee a reply, as I have to prioritise my writing at the moment, but I'll try my best to get round to it when I can. By the end of this trip, I was also filled, once again, with appreciation for translators, the often-unsung heroes of the publishing world. Without Lenka, my words would never have reached so many people in the Czech Republic. The Bone Season is not a particularly easy book to translate, by all accounts, but from what I heard from readers, the slang and spirit of the story have been carefully preserved in Czech. Thank you very much to HOST and the Municipal Library for having me in Prague. I'm thrilled to announce that we just sold The Song Rising in Czech, so you'll definitely be seeing the translation within the next year or two. You can see a couple more photos from my trip on my shiny new Instagram. I had a different account a while back and ended up deleting it, but now I've figured out how to use it in a way I like: to celebrate books and words, and to be part of the passionate world of Bookstagram. Now I'm back in London, I'm also back to work on The Priory of the Orange Tree and the fourth Bone Season book. However, you have not one, not two, but four chances to see me speaking alongside some of my very talented peers in London this month. Check my upcoming events page for details. I haven't been doing a huge amount of reading lately due to my workload, but I must take a moment to sing the praises of Barefoot on the Wind by Zoë Marriott, which I finished on the plane to Prague. It's a stunning retelling of Beauty and the Beast, set in the same Japan-inspired fantasy world as Shadows on the Moon. I'm a sucker for Beauty and the Beast, so this was right up my alley. 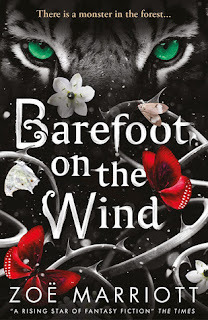 Barefoot on the Wind has a sympathetic and daring protagonist, a morally complex love interest who I immediately adored (and who forms a solid, respectful friendship with the protagonist before romantic feelings blossom), and a haunting setting that I'm still thinking about. I'm looking forward to chairing a conversation with Zoë and Alwyn Hamilton at YA Shot 2016 this month so I can ask her some burning questions about it. I'd like to encourage everyone, but Brits in particular, to go out and get The Good Immigrant, edited by Nikesh Shukla – a collection of twenty-one powerful essays about what it means to be black, Asian and minority ethnic in modern Britain. It's an important read, especially in the post-Brexit climate, and it's rightfully flying off the shelves. I learned a lot about the immigrant experience in this country from reading it. Finally, I just got my hands on And a Happy New Year? by Holly Bourne, which I'll probably start this evening. If you haven't read the hilarious, feminism-themed Spinster Club trilogy yet, you're really missing out. Grab yourself a copy of Am I Normal Yet? to start your emotional rollercoaster ride with Evie, Amber and Lottie. I enjoyed seeing photos of your trip to Prague! I also wanted to go and visit after reading the Daughter of Smoke and Bone trilogy. Hope I get to go one day! Samantha Shannon, author of international bestseller The Bone Season – first in a series of seven books about clairvoyants in the future. The third instalment, The Song Rising, is out now. 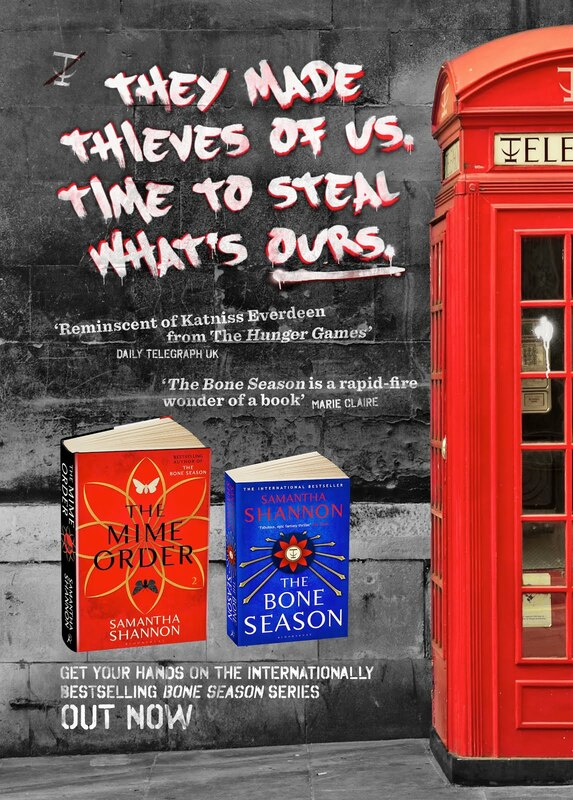 I started A Book from the Beginning in 2012 as a resource for aspiring writers, tracking The Bone Season from agent to editor to reader and beyond. The blog now covers different aspects of the publishing industry, life as an author, and literary hot topics. Blog © 2016 Samantha Shannon-Jones. Simple theme. Theme images by cobalt. Powered by Blogger.